What Are the Best Online Master's in Organizational Psychology Programs? What Can I Expect From an Online Master's in Organizational Psychology Program? Online master's in organizational psychology programs teach students how to analyze human behavior and its impact on the workplace. Coursework covers topics such as leadership development, workplace diversity, recruiting and retaining employees, training and development, researching successful workplaces, and assessing employee performance and satisfaction. As businesses become increasingly eager to maximize human capital and efficiency, more companies continue to hire organizational psychologists. The Bureau of Labor Statistics (BLS) projects the demand for organizational psychologists to grow 8% between 2016 and 2026. The best online master's in organizational psychology programs provide students with the necessary skills to advance their careers and earn higher salaries. Learners gain an understanding of the theories of organizational psychology and how to apply them in various fields and job settings. An online program ideal for one person may not necessarily work for another person, so you need to decide which program traits matter most to you. Consider cost, types of courses required, program length, accreditation status, class size, internship requirements, available specializations, and faculty. CAN I WORK WHILE I COMPLETE MY ONLINE MASTER'S IN ORGANIZATIONAL PSYCHOLOGY? Most students pursuing online degrees continue to work while in school -- a major benefit of earning your master's degree in organizational psychology online. While you still need to meet deadlines, studying online provides the flexibility to continue working while in school. WHAT ARE THE ADVANTAGES TO EARNING MY ORGANIZATIONAL PSYCHOLOGY DEGREE ONLINE? Earning your master's degree in organizational psychology online allows for flexibility in your time management. Rather than attending classes at specific times, you can log on and complete coursework at your convenience. Other benefits include affordability and a wider scope of program options. Established in 1880, the University of Southern California is a private research university that serves around 47,500 students through 21 academic schools and units. USC's School of Arts and Sciences offers an online MS in applied psychology with a concentration in organizational psychology. The applied psychology MS consists of 34 total credits of core courses, concentration classes, and a capstone component. Students complete five required courses on topics such as human behavior, research methods, social psychology, and consumer psychology. They also choose two courses in a concentration. Organizational psychology students can select from three courses: strategic business relationships, psychology of organizational change, and group dynamics and leadership. In addition to online coursework, students complete an in-person internship. During the internship, students take a course in which they discuss their experiences and complete internship-related assignments. Some learners conduct a study during their internship and compile their research into a capstone treatise. Students complete the program in 16 months by taking two online courses per term. The program boasts three start dates in the fall, spring, and summer terms. Applicants to the MS in applied psychology program must submit official GRE scores along with official transcripts from all postsecondary institutions attended. Additionally, prospective students must submit a resume, three letters of reference, and a statement of purpose. The 750-word statement of purpose should describe the applicant's interest in applied psychology and their reasons for choosing USC's program. Based in Los Alamitos, California, Touro University Worldwide is a private, nonprofit institution that educates associate, bachelor's, master's, and doctoral students through four schools. The School of Psychology's online master's in industrial and organizational psychology teaches students about the relationships among mental health, productivity, and profitability. Students learn to work with employees to improve morale, productivity, and collaboration. They study the latest theories and research related to behavior in organizational settings. Industrial and organizational psychology learners complete 36 credits through 12 courses. Students take nine core courses that explore topics like performance assessment, statistical methods, and organizational behavior. Through a core course on organizational change, students examine methods for managing change, optimizing operations, and fostering innovation. A class on developing high-performance teamwork equips students with the skills needed to encourage collaboration and resolve conflicts. In addition to core classes, students take three courses in a concentration. Students looking to work as an organizational consultant or executive coach can specialize in coaching and consulting. Learners interested in training and development, corporate culture, and performance evaluation may focus on human resource management. Students can also explore workplace health and injuries through the occupational health psychology concentration. Regardless of their specialization, learners complete a capstone project that contributes to their organization, career, or field. Applicants need an accredited bachelor's degree with at least a 2.5 GPA. Students transferring from another university must demonstrate a 2.75 GPA or higher. Founded in 1856, the University of Maryland, College Park is the flagship institution of the University System of Maryland. The school boasts over 41,000 students and extensive academic offerings. UMD's master of professional studies in industrial/organizational psychology comprises 30 credits from 10 courses. The program builds students' knowledge of organizational psychology and business operations. Learners study topics like statistical methods, research methods, and organizational change management. They also learn about legal issues in businesses and business fundamentals. The curriculum includes coursework that builds skills in human resources management and professional development. A course in talent development teaches students to design and implement employee training programs. The course covers nontraditional learning theory and introduces popular assessment tools. Another class provides an overview of performance management, compensation, and benefits. Students learn to develop reward and feedback systems that motivate employees. At the end of the program, learners complete a practicum. They apply what they learned throughout the program to a job in a real organization. Over the course of the practicum, students write a paper reflecting on the skills they applied and developed. The online master's in industrial and organizational psychology features a blended, cohort-based curriculum. Students take asynchronous online classes based on pre-recorded lectures and interviews with practitioners. They also participate in some webcam-based synchronous lectures and discussions. Learners attend in-person sessions during the evening at UMD's College Park campus, earning a degree in 15 months through five, 12-week terms. Founded in 1901, Golden Gate University is a private, nonprofit institution focused on educating nontraditional learners. The school boasts undergraduate and graduate programs across business, accounting, information technology, psychology, and other areas. GGU serves over 5,000 students through its online programs. GGU offers the MA in industrial-organizational psychology on campus, online, and in a hybrid format. Online students study asynchronously while participating in online discussions with their instructors and classmates. The curriculum consists of 42 credits from 14 courses. Students take 11 required classes in topics like organizational behavior, diversity, international human resource management, and group dynamics in organizations. Learners also select three electives from a list of nine classes. Distance learners can take advantage of many student services. Learners can sign up for online tutoring with GGU instructors and master's-educated tutors. Through the Career Services site, students can access a job board along with online workshops that teach students about resumes, networking, interviews, and salaries. Applicants need a bachelor's degree from a regionally accredited U.S. institution to qualify for admission. They must also submit official academic transcripts. Students who do not demonstrate academic readiness through their transcripts may need to submit GMAT or GRE scores. Optionally, students may write a personal statement to supplement their application. Incoming graduate learners may transfer in up to six credits of graduate-level coursework. Students must hold at least a "B" in any coursework they wish to transfer toward a master's degree. Established in 1870, Colorado State University is a public research university and the flagship institution of the Colorado State University System. CSU boasts close to 40 web-based master's programs, including one of the top online master's degree programs in industrial/organizational psychology. Students pursuing the master of applied industrial/organizational psychology complete 38 credits. The degree requires 13 classes and no thesis component. Learners take classes across topics like workforce training, applied psychological research methods, and organizational development. One required course explores strategies for succession planning and leadership development. Another class examines the role of cultures and individual differences in organizations. CSU's MA in industrial/organizational psychology offers a self-paced, online format. The curriculum stresses experiential learning, with students participating in simulations throughout the program. CSU divides students into virtual consulting teams who collaborate on several projects each term. With the help of course facilitators, student groups may design leadership development programs or conduct an organizational diagnosis. Students who take two courses per term earn their degree in two years. Applicants need a regionally accredited bachelor's degree with a minimum 3.0 GPA. They also need at least a "B" in an undergraduate class in industrial psychology, organizational psychology, human resource management, or organizational behavior. They also need a "B" in an undergraduate statistics class. Prospective students must submit GRE scores and GRE Psychology Subject Test results. The Chicago School of Professional Psychology is a nonprofit institution that serves over 4,000 students through more than 20 academic programs. The school boasts many psychology-related programs dealing with topics such as applied behavior analysis, clinical psychopharmacology, and clinical mental health counseling. Students can earn a degree online or through seven campus locations. Distance learners can pursue an MA in industrial and organizational psychology with an applied research project track. Like many of the best industrial organizational psychology master's programs online, the program covers subjects like personnel selection, employee training, leadership development, and motivation. Students complete 40 credits through core classes, seminars, applied research project courses, and electives. Elective options include consumer motivation, productive labor relations, and strategic planning in healthcare diversity. Full-time students earn the master's degree in two years, while part-time students finish the program in four years. Learners complete six credits through an applied research project. During six, one-credit courses, students work on their project and receive guidance from a faculty adviser. In the final applied research class, they present their project and defend their findings. Applicants need at least three years of relevant work experience or five years of unrelated professional experience. They also must complete three prerequisite undergraduate courses in psychology, statistics or quantitative psychology, and research methods or experimental psychology. Additionally, prospective students must submit an essay, three letters of recommendation, and a resume. Based in Chicago, National Louis University is a private institution in operation since 1886. The university educates over 7,000 students through four academic colleges and seven campus locations. Additionally, NLU students can choose from 17 online programs, including an MS in industrial and organizational psychology. The interdisciplinary degree draws on topics from the School of Social and Behavioral Sciences along with the School of Business and Management. Like other industrial and organizational psychology master's programs online, NLU's program explores applications of psychology in the workplace. Students learn to solve organizational problems, increase efficiency, and improve worker happiness. To earn the master's in industrial and organizational psychology, students complete 36-42 credits. They take two foundational courses in research methodology and psychology. Learners also complete nine core courses that cover areas like psychological statistics, job attitudes, talent acquisition, and performance analysis. Students complete the MS in industrial and organizational psychology curriculum entirely online and finish the degree in as few as 20 months. Learners can pursue a dual-degree option that combines coursework from industrial/organizational psychology and human resource management degrees. Applicants must submit official college transcripts and demonstrate at least a 3.0 GPA. Additionally, learners must provide official Criterion Online Writing Assessment scores or a professional writing sample. NLU waives the writing requirement for students with a 3.0 GPA or a previous master's degree. Prospective students also need to submit a resume and two professional letters of recommendation. Carlos Albizu University is a private, nonprofit university with campuses in Puerto Rico and Miami. The school was founded in 1966 to offer an MS in clinical psychology. Today, Albizu University boasts degrees across psychology, education, business, speech, and other fields. Students can choose from two web-based programs, including an online master's degree in industrial and organizational psychology. Learners pursuing the MS in industrial and organizational psychology take 48 credits through 16 courses. They complete 18 credits through foundation courses that cover research methods, statistics, attitude theory, and basic concepts in industrial and organizational psychology. They also take 24 credits of core courses that discuss areas like motivation, employment law, psychological assessment techniques, and organizational development. Learners complete the final six credits with a capstone project. Albizu University offers online support to distance learners. Through a 24/7 helpdesk, students can chat with a live representative and request technical assistance. Additionally, online learners can consult the online library and buy books through the campus portal. Albizu University prefers applicants with at least a 3.0 GPA, but the school considers students with a 2.5 GPA or higher on a case-by-case basis. Students must hold at least a "B" in an upper-division undergraduate statistics course to qualify for admission. Learners without sufficient statistics experience who satisfy all other requirements may take a basic statistics course during their first term. Transfer students can apply up to six credits toward a master's degree. They must earn at least a "B" in any courses they wish to transfer. Based in Rolla, Missouri University of Science and Technology is a public institution serving over 8,600 students through 99 academic programs. Founded as a technological institution in 1870, Missouri S&T currently boasts programs across 40 academic fields, such as business, liberal arts, and psychology. Graduate students can pursue 18 online degrees, including an MS in industrial-organizational psychology. The industrial-organizational psychology curriculum includes 40 credits, and students can choose a thesis or non-thesis track. Students interested in a research-oriented career might decide to earn six credits through a thesis. Non-thesis students can choose from two graduate certificate options: applied workplace psychology or statistical methods in psychology. Regardless of their track, students complete 24 credits of core classes and 10 credits of research methods courses. Missouri S&T's online learners typically take 1-2 classes per semester and earn a master's degree in 3-4 years. Master's in industrial-organizational students can watch lectures live or view them at a later time. While students can complete most coursework asynchronously, some professors incorporate synchronous presentations or discussions into their courses. Applicants must submit transcripts, GRE scores, three letters of recommendation, and a statement of purpose. For the statement of purpose, students describe why they are applying to the master's in industrial-organizational psychology in 2-3 paragraphs. Incoming graduate students may transfer up to nine credits toward a master's degree. Students can only transfer graduate-level courses with a "B" or better. Founded in 1863, Kansas State University is the oldest public institution in the state. K-State boasts over 70 online programs, including an MS in psychology with an emphasis in industrial and organizational psychology. K-State's industrial and organizational psychology master's features a hybrid delivery format that includes on-campus summer sessions, online classes, and a practicum. Students attend two-week, in-person sessions during the summer in their first and second years. On-campus sessions last from 8:30 a.m. to 5:00 p.m and include lectures, presentations, seminars, and computer laboratory project work. Online classes include readings, assignments, and message board discussions. Students typically spend 6-7 hours per week on each three-credit graduate course and finish the program in 2.5 years. Students complete 38 credits. Each fall and spring semester, students take one online course focused on personnel selection, performance appraisal, organizational psychology, or personnel training. Additionally, students take a course that guides their practicum research each semester. During their third summer term, students work with a faculty adviser to write a report that explores a human resources issue. Applicants need at least a 3.0 GPA in their final 60 credits of bachelor's study. K-State requires two years of professional experience and prefers applicants with two years of experience in a supervisory role. In addition, prospective students must demonstrate prerequisite knowledge in psychology, the social sciences, human resources, management, and statistics. Students with a GPA lower than 3.0 may need to submit GMAT or GRE scores. Established in 1966, Bellevue University is a private, nonprofit institution that serves close to 9,000 students annually. Bellevue operates four colleges with over 80 degree options. Distance learners can choose from more than 75 online programs at the bachelor's, master's, and doctoral levels. Bellevue offers the MS in industrial and organizational psychology exclusively online in an accelerated cohort format. Students focus on one course at a time and progress through the curriculum with a group of classmates. Students can take advantage of online resources, including 24/7 technical help, academic advising, and online library resources. MS in industrial and organizational psychology learners complete 36 credits through 12 courses. An introductory course, profession of industrial/organizational psychology, teaches students about the strategies that practitioners use in the field. Another core course explores employee relationships, motivations, and attitudes from a social psychology perspective. In addition, students take courses in statistical methods, personnel selection, job analysis, and performance appraisal. Bellevue's program stresses experiential learning; students complete a practicum along with an applied research capstone. During the supervised practicum experience, master's learners apply their psychology skills to a workplace and begin planning their applied research project. By the end of the program, students complete research projects that include data analysis, data visualizations, and conclusions relevant to the sponsoring company. Applicants need at least a 2.5 GPA in their last 60 credits of bachelor's coursework. Founded in 1932, Southern New Hampshire University is a private institution offering over 200 programs from the certificate to the doctoral level. The school serves over 3,000 on-campus students along with more than 90,000 distance learners. Online students can pursue 100 master's programs, including an MS in psychology with a concentration in industrial-organizational psychology. The 36-credit industrial-organizational psychology master's requires 12 courses. Through two research methods classes, students learn how to collect information, analyze data, and design advanced research studies. A class on ethical practice in psychology explores topics like ethical behavior, professional standards of conduct, and confidentiality. Another course builds the skills students need to work in organizational consulting. Through a psychology capstone course, students integrate the skills and knowledge they developed throughout the program. In a culminating seminar in industrial and organizational psychology, learners demonstrate their competence in the fields of motivation, consulting, and organizational leadership. By taking two courses during each 10-week term, students complete the master's degree in as few as 15 months. SNHU delivers the psychology program through asynchronous courses. Applicants to the online master's in psychology need a BA or a BS in psychology. Students with an unrelated bachelor's degree need undergraduate coursework in psychology, social science statistics, and research methods in social science. Applicants who cannot satisfy prerequisite course requirements must take three introductory courses at SNHU. The university admits new graduate students on a rolling basis during five terms per year. Based in Richmond, Eastern Kentucky University is a public institution that serves approximately 16,000 students. The school offers programs on the main campus, at five regional locations, and online. Distance learners can choose from over 40 undergraduate, graduate, and certificate programs. The MS in industrial-organizational psychology includes a 36-credit curriculum that students complete entirely online through the Blackboard Learning System. Students complete coursework asynchronously through self-paced, eight-week terms. They explore typical industrial-organizational psychology topics, including quantitative research methods, performance management, and training and development. Students also complete a supervised practicum at an approved organization. Students can take advantage of many resources, including online tutoring. EKU provides a variety of tutoring services through SmartThinking and the Student Success Center. Additionally, the psychology department boasts its own tutoring program. Online learners can also access online databases, journals, and eBooks through the school library. Applicants need at least a 2.75 undergraduate GPA and a 3.0 GPA in their last 60 credits of bachelor's coursework. They also must complete undergraduate coursework in psychology and statistics to qualify for admission. Students with an overall undergraduate GPA below 3.0 need to submit GRE scores. EKU admits students who achieve at least a 249 on the verbal section and at least a 144 on the quantitative section. All EKU online students pay the same tuition rate regardless of residency. Based in Clarksville, Tennessee, Austin Peay State University is a public institution that serves around 11,000 students through 75 bachelor's and master's programs. The school boasts a student-to-faculty ratio of 16-to-1 and an average class size of 24. Learners can choose from over 20 online programs. The online MS in industrial-organizational psychology features a curriculum that adheres to the Society for Industrial and Organizational Psychology's training guidelines. Students take 34 credits that prepare them to apply psychological concepts in organizations. Learners explore areas including general psychology, organization theory, employee performance, and work analysis. Full-time students earn the degree in two years. The curriculum includes four foundation courses that discuss research methods, applied psychology, and applied measurement in industrial/organizational psychology. In addition, students take six core classes and two electives. Elective options include cross-cultural industrial/organizational psychology and occupational health psychology. Students can also complete three credits through a 180-hour supervised internship. Applicants need a cumulative undergraduate GPA of 2.5 or higher, but most admitted students hold at least a 3.0 GPA. Students must complete at least 12 credits of psychology or related courses as part of their undergraduate coursework. Additionally, prospective graduate students need at least a 143 on the verbal section of the GRE and at least a 138 on the quantitative section. Applicants also must submit three letters of recommendation and a brief personal statement. Based in Columbus, Ohio, Franklin University is a private institution that serves nontraditional learners at more than 25 locations and online. Students can choose from 50 bachelor's and master's programs across business, healthcare, computer science, management, and many other fields. Nearly 80% of Franklin's students take online courses. Master's students can pursue an online master's in business psychology that explores marketing, economics, finance, and human resources from the perspective of psychology and neuroscience. The program includes some elements common to organizational psychology programs along with business-focused coursework. Students take 36 credits through nine courses. Courses include topics like social psychology, training and development, and leadership coaching. One course on behavioral economics and neurofinance explores how the brain limits financial decision-making. Through another course, students examine creativity and innovation through a psychology lens. A class on psychology of marketing introduces science-based strategies that professionals use to influence consumers and promote products. Learners end the program with a course titled business psychology mastery demonstration. During the course, students complete a major project that proves their mastery of business psychology. Students can finish the degree entirely online in 14 months. Applicants need a bachelor's degree from a regionally accredited institution. They also need at least a 2.75 GPA; students with lower grades may need to submit GMAT or GRE scores. Incoming students may transfer in up to 12 graduate-level credits from prior coursework or certifications. 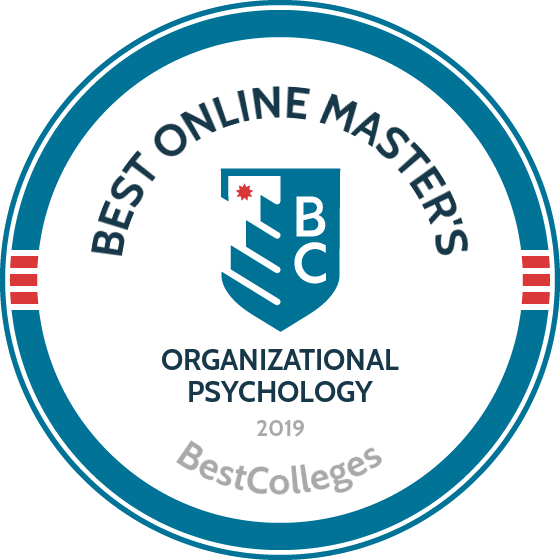 The best online master's in organizational psychology programs help students understand how human behavior impacts a business' successes and failures. Students use psychological theories to identify, evaluate, and solve business problems. Specific coursework and program structures vary by school. While admission requirements for master's in organizational psychology online programs vary, standard requirements for most programs include completing an online application, paying an application fee (typically $50-$75), and providing all transcripts of previous coursework. The best online master's programs in organizational psychology also require an essay or personal statement, three letters of recommendation, and a CV or professional resume. Students with a cumulative minimum undergraduate GPA of 2.5 and a graduate GPA of 3.0 receive priority admission status. Schools requiring GRE scores typically maintain minimums of 149 on the verbal and 144 on the quantitative sections; applicants with at least a 3.0 cumulative GPA may receive a GRE waiver. For prospective students without an undergraduate degree in psychology, business, or a related field, some schools require proof of undergraduate courses in statistics and a minimum of two upper division courses in psychology and business. The types of courses offered in online master's in organizational psychology programs vary by school. Some programs focus on psychological theory and practice, while others spend more time covering business principles. The outline below includes sample curriculum for a master's in organizational psychology online program. Applied Organizational Psychology: Learners examine topics such as leadership, group performance, motivation, organizational culture and climate, job attitudes, and organization development. Students apply these concepts to real-world problems in preparation for careers as organizational psychologists. Applied Industrial Psychology: This course introduces key methodologies such as training and development, competency modeling, performance management, and selection and validation to prepare students for careers as management analysts. Workforce Training and Development: Students explore adult learning theory and how organizational psychology helps identify training needs to create learning programs. The course prepares learners for careers as human resource managers. Leadership Development: This course outlines theories of effective leadership, including coaching, training, mentorship, and professional development -- providing skills required for training and development managers. How Long Does it Take to Get a Master's in Organizational Psychology Online? The amount of time required to complete an online master's in organizational psychology program depends on factors such as the number of courses taken per term, the amount of time off, and the available concentrations or specializations. Required internships or work experience may also increase the amount of time necessary. When researching prospective schools, consider whether programs offer courses year-round, and whether the school offers the required courses each term. Some programs organize students into cohorts, where students complete programs in small groups to foster a sense of community. Cohorts usually finish their programs together, at predetermined times. Individually paced programs offer more flexibility. Most students take two years to complete an online master's in organizational psychology. How Much Does an Online Master's in Organizational Psychology Cost? In general, costs for the best online master's programs in organizational psychology range from $20,000 to $30,000 for the full program, including tuition and all other required fees. Although many schools offer the same tuition rates to residents and nonresidents, some charge higher tuition for out-of-state students. Online students should also calculator for technology fees of approximately $100-$150 per term. Some learners may find ways to offset these costs by taking advantage of tuition discounts for qualifying military service members, veterans, and families. Many schools offer military students up to 50% discounts on tuition. Certified Management Consultant: This certification improves job opportunities for management analysts by demonstrating a candidate's education and commitment to ethical standards. There are three levels of qualification, based on work experience. Applicants must submit documentation and answers to test questions, take an online ethics exam, and pass an oral exam. Society for Human Resource Management Certification: Although not required for human resource managers, some businesses only hire those with this certification, and most companies tend to prioritize certified candidates. Applicants must meet certain educational work experience criteria. Students should look for an online master's in organizational psychology program at an accredited college or university. Accreditation ensures a certain level of quality in an institution's educational programs. U.S. colleges and universities may receive regional or national accreditation. Generally, regional accreditation serves as the more highly recognized, and coursework from regionally accredited schools tends to transfer more easily. Choosing an accredited program helps students ensure the quality of their education. No industry-specific organization accredits organizational psychology programs. However, the Society for Industrial and Organizational Psychology maintains a set of guidelines for education and training in the industrial organizational psychology space -- thus assessing master's programs in organizational psychology. The Department of Education (ED) and the Council for Higher Education Accreditation (CHEA) both play important roles in accreditation. The ED establishes educational policy, manages federal financial assistance programs regarding student loans and grants, and publishes a list of nationally recognized accreditors. CHEA, a group of American colleges and universities, ensures that the accrediting agencies are trustworthy. To see a list of accredited schools in the U.S., visit the ED website or CHEA website. Most online master's in industrial organizational psychology programs conclude with a capstone, supervised practicum, or other applied research project carried out with a real-world organization. Online students typically work in virtual teams under the guidance of a mentor to develop appropriate consulting skills. Many programs also offer on-site internships as an elective. Some schools offer students a choice between an internship track and a separate capstone track, with the latter option tailored toward employed students who intend to complete the project at their current place of work. While most programs do not require a thesis, a few programs offer a thesis option. Graduates of online master's in organizational psychology programs can seek work in a variety of fields and positions. Many job opportunities require solid interpersonal, communication, decision-making, leadership skills, and the ability to analyze human behavior effectively. Industrial organizational psychologists identify and solve workplace problems using psychological theories and tools. Most psychologists must possess a Ph.D. to practice, but industrial organizational psychologists only need a master's degree. They may boast involvement in training and development, organizational development and analysis, and employee selection. Human resource managers oversee the administrative functions of an organization, including recruiting, interviewing, hiring, and firing staff. They serve as intermediaries between managers and employees. Most positions require applicants to hold bachelor's degrees, but master's degrees garner higher salaries and lead to more advancement opportunities. Training and development managers oversee planning, directing, and managing programs to improve employees' knowledge and skills. They work in nearly every industry, and some positions require master's degrees. Often called management consultants, management analysts create ways to make organizations more efficient and profitable. Most management analysts hold at least a bachelor's degree. Companies typically hire management analysts as consultants. Market research analysts figure out what products people want. Almost all industries use market research. An applicant with a master's degree may discover career opportunities in some higher positions. Salaries for graduates of master's in organizational psychology programs vary depending on work experience, geographic location, and the individual workplace. The type of industry substantially impacts organizational psychologists' earnings. Human resource manager positions boast very high earning potential. The table below breaks down data from the BLS to determine expected salaries for human resource managers. The table below presents data on earning power over time for five related professions. The highest increase applies to industrial organizational psychologists, whose earnings average $61,000 at the entry level and $131,000 in later career stages. The lowest increase applies to market research analysts, with salary averages advancing from $49,000 in the early stages to $64,000 in later time periods. Joining professional organizations allows students and graduates of online master's in organizational psychology programs to network with established professionals, learn about job openings in the field, and enroll in professional development courses. Membership also keeps professionals current with the newest discoveries, theories, and practices in organizational psychology. The members of SIOP teach and practice industrial and organizational psychology. The organization works to increase support for industrial and organizational psychology research and practice at the national policy level. The APA represents researchers, educators, consultants, students, and clinicians in the field of psychology to advance psychological knowledge on the personal and societal levels. This organization provides leadership, education, and resources to human resources professionals. Students enjoy plenty of options to fund their master's degrees in organizational psychology. Start by filling out a FAFSA form to help you understand federal funding options, such as student loans, scholarships, grants, and work-study opportunities. Private organizations and individuals also offer scholarships and grants to organizational psychology students. The APA provides a guide to help students research funding, scholarships, and awards. Financial aid for online learning is equivalent to what you will find for campus-based learning, but that has not always been the case. Learn about changes in aid and about the different funding opportunities available to online students. Online college programs serve as a flexible, affordable option for single parents interested in earning a degree and securing their family's financial future. This link provides a list of scholarships, grants, and other financial aid options geared toward single moms and dads.